Atomic Blonde - 4K UHD Review - ReDVDit! Atomic Blonde is a 2017 American action spy thriller film that was directed by David Leitch in his first solo directorial credit, and was written by Kurt Johnstad. 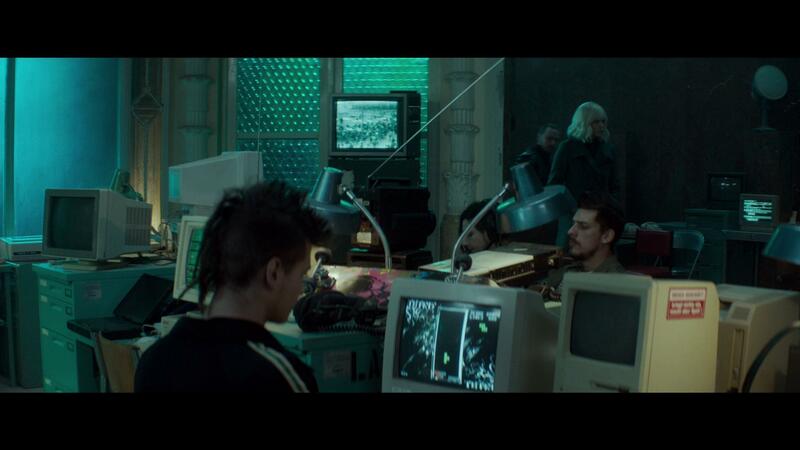 It is based on Antony Johnston and Sam Hart’s 2012 graphic novel titled The Coldest City, published by One Press, which revolves around a spy who has to find a list of double agents who are being smuggled into the West, on the eve of the collapse of the Berlin Wall in 1989. 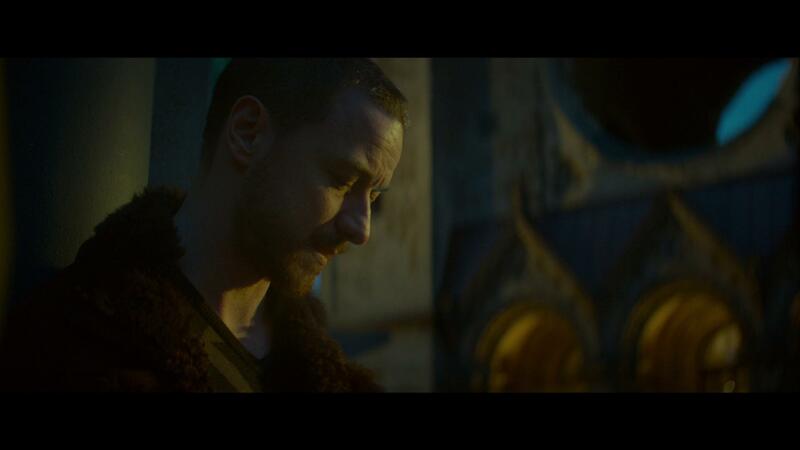 Featuring a star studded cast that includes Charlize Theron and James McAvoy as title characters, and John Goodman, Til Schweiger, Eddie Marsan, Sofia Boutella, and Toby Jones in supporting roles. Having its world premier at South by Southwest on March 12, 2017, it was theatrically released within the US on July 28, 2017 by Focus Features. Overall, it has grossed $95 million worldwide, and received generally positive reviews from film critics, who praised it for its action sequences, Theron’s and McAvoy’s performances, and the soundtrack. Some have criticized the writing and pacing of the film; while many have compared it to the action series John Wick, for which Leitch was an uncredited co-director on the first film and producer. Atomic Blonde was a film that I wasn’t completely sure of after seeing the promotional material during its theatrical run. Sure, the trailers made this film out to be a really badass spy film that is comparable to the likes of the Mission: Impossible series. But, unfortunately the overall pacing and storyline made the film considerably difficult to follow. Just as emphasized from film critics, the performances of Theron and McAvoy were absolutely phenomenal. Hell, the performances of those who were in supporting roles were awesome. Giving audiences some really awesome action sequences and a phenomenal music score, the story of the film itself was a little difficult to follow and could’ve been adapted better. 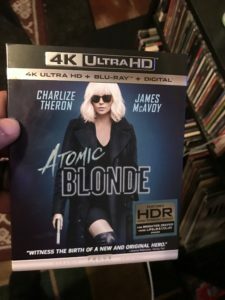 Unfortunately, Atomic Blonde is not a “true 4K” release as it’s been upconverted from 4K. That said though, this particular release looked really great as my wife and I watched it last night. There were some problematic scenes where the ambient lighting wasn’t as sufficient as it should’ve been and the use of HDR not really doing a good job with the blacks. But, those scenes were considerably minimal and overall, this film really shines with its use of HDR10 and DolbyVision. 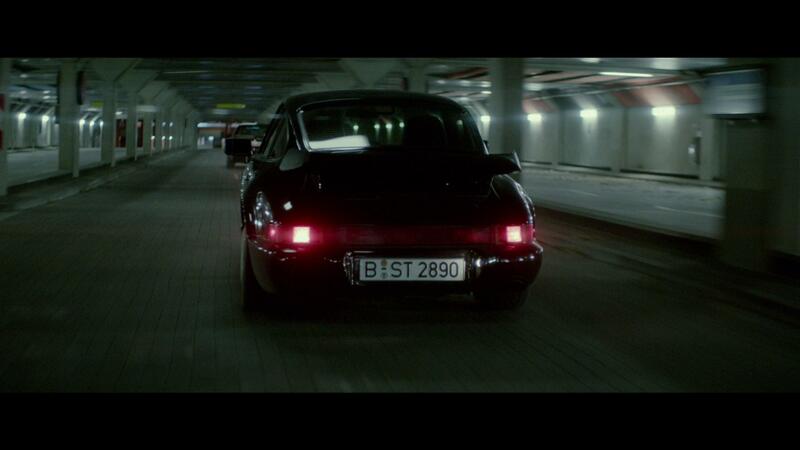 Some of the most notable sequences were those that took place throughout the Berlin cityscape. The finer details of the city really stood out and made the experience really feel that much more real. Packaged with a DTS:X, not only does Atomic Blonde offer an all out immersive experience for its viewers, but it offers that experience with so much impact, it perfectly conveys the seriousness of what is unfolding between the characters. Doing an absolutely fantastic job at placing viewers in the middle of everything, the film also includes a stellar musical accompaniment that makes for a more fun experience and allows audiences to know that the story of this film is meant to be fun. 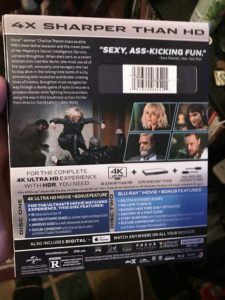 Atomic Blonde comes packaged in your standard two disc 4K UHD amaray case. Within that case you’ll find the standard 4K UHD copy of the film as well as the standard Blu-ray copy of the film. The UHD disc does feature artwork that is similar to that of the case art while the Blu-ray disc does not feature any artwork outside of the standard release text. A digital copy redemption pamphlet has also been included with this release as well as a slipcover that features artwork that matches that of the case art. Overall, Atomic Blonde was a good time. Despite the convoluted story line that has the unfortunate issues with its pacing, it wasn’t that bad at all. Sure, it took a little bit for the foundation itself to get built and the overall progression being problematic, but the action sequences and comedic music accompaniment made for a good time. The general visual and audible presentation was really good, despite the film being an upconversion from a 2K digital intermediate. It does have some issues with the scenes that offer lower than your average amount of lighting, but overall it looked really good due to its inclusion of HDR. The packaging for this release isn’t anything of significance, but I don’t really expect much when it comes to standard releases anymore in that sense. There is a feature audio presentation that was included on the UHD disc that was nice, and a decent amount of bonus content that’s been made available on the included Blu-ray disc. I would definitely recommend picking this film up if you had any interest in seeing it from the promotional material, but be warned about the issues with the story and its pacing. If you’re going into this film blind and are interested in checking it out, I’d recommend waiting for it to go on sale.